Aluminum door and window awnings need very little maintenance. The main thing to do is to keep it clean. Just use a soft bristle brush and hose it down from time to time. If you let it go for too long the build-up of grime and pollution will be heavier and harder to remove. Try this solution which is also good for cleaning vinyl products: mix one gallon of water with 1/3 cup of powdered laundry detergent and 2/3 cup of tri-sodium phosphate. 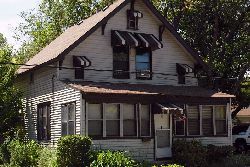 Aluminum window and door awnings have been around for a long time. Widely available by the early 1950s, aluminum awnings were touted as longer-lasting and lower-maintenance than traditional awnings made of canvas. Even today, they are available in many colors and are usually painted with a baked-on enamel paint. Among the many benefits of these awnings are cooler temperatures inside the home and, by keeping the sun out, longer life span of furniture and window treatments. The window and door awnings can be custom made and finished in colours to complement the house. A nice example can be seen in the pictures to the right. Even the tiny windows on the top floor have their own aluminum awnings. Did you also notice the two window air conditioning units in the photo? The demand for aluminum door and window awnings dwindled as central air conditioning became more popular. 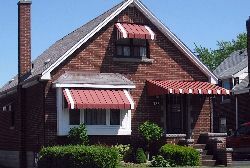 Aluminum awnings have been around since the early 1950s. They are economical and have a life span of some 40+ years. Why install aluminum window awnings? - Will not warp, rot or rust. - Last longer than coverings such as canvas, fabric or other materials. - The baked-on enamel paint will look good for many years. - Helps to cut down on your energy consumption. If the aluminum window awnings are in in shady location you should clean the awnings more often to prevent mildew problems.